Our title today is the first line of a recent message I received from someone who shall remain nameless. I’ve gotten plenty of messages like this over the years, including some from my own family. However, this message, despite its content, was presented politely, kindly, and with no ugly language—unlike others I’ve received. The Lord Jesus Christ is very real and so is satan and his fallen angels. Do you ever wonder where your “spirit guide” came from or what “it” actually is?? Its from satan…non other…one is in contact & reliable on information with non other than a “demon” in disguise.. The absolute truth is this John, they (satan & his fallen angels who run this earthly world and rule it) totally hate us with a passion. They hate the fact that Jesus died on the cross for us, to save us from our sins and give us eternal life. satan already knows that he is defeated by Jesus dying on the cross for mankind. I email you John not out of malice or disrespect. Certainly not… I came across your website by accident really (maybe I was meant to ) I felt compelled to just tell you this. Im attacked daily John…….. by demonic mental torture, that manifests itsself in my inner thoughts / feelings/. They know where to “hit where it hurts” they know how to get me wound up and what hurts me ..they know my weakness’s and boy do they make a battlefield in my mind at times….Demonic mental warfare is what it is. Again, please don’t think im trying to run down your website or your beliefs..respect to you and your decision as to what you believe in ) .. We all are free to choose what we believe in & put our faith into……… The Real God I Am Who I Am is sadly not in most of to-days churches or chapels. Mankind runs them and has them tailored to suit his own “God belief” system…. My spirit guides have often said evil, as humans perceive or define it, simply doesn’t exist. There is no source of evil. If, as they say, God is all that is, then what we call evil is also part of God. Equating God with evil makes no sense to me. In this video Abraham, channeled by Esther Hicks, give us their perspective on devils and fallen angels. Are We Coming To the End of the World? Do you believe in Satan, or the devil? Whether you answer “Yes” or “No,” why? Is evil an entity, or just a fiction? Please share your thoughts and comments with us below. Writer and publisher John Cali talks to ghosts and dead people. He writes about these adventures at his blog and website, and in his upcoming book, Conversations with Spirit: Real Answers To Life’s Pesky Questions, Book 1. He’s written 10 books, and numerous articles on aviation, the environment, business, real estate, and legal education for various publications, including The American Bar Association Journal, Aircraft Interiors, and National Neighborhood News. Subscribe to his newsletter and receive a free copy of The Book of Joy: How To Live Every Day of Your Life Happily Ever After. dicey experiences with dark forces,so I do know these things exist. not so kind energies into your world. 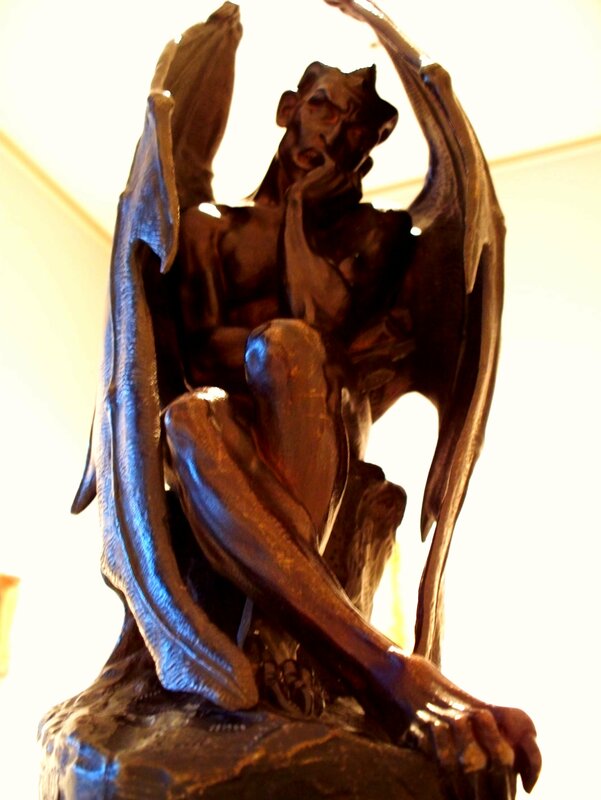 Did God create Satan, His version of the boogeyman, to keep us in line? Or, did the church create it instead? Or, was this creation made even before the creation of the church? In a way, this God/Devil business is sort of like a program, isn’t it? time: if one pushes the blanket away, one would see another reality that just is. No need for agendas or fear. About 8 years ago, I realized that there is a God of religion and what I call, The God Beyond God. It is this God (Universe/Prime Creator) who I adhere to and this Energy is one of Love. Like you, I don’t believe in Satan. I do think, however, we sometimes perceive “dark” forces. Not that God created them. But the churches certainly have supported that notion. I like your analogy of the blanket. In my opinion — and my spirit guides agree with me on this — darkness is not an evil entity. God did not create evil or darkness. If, as I believe, God is all that is, all that is good — then how can evil or darkness be part of God? Darkness is nothing but the absence of light. If we shine the light that we all are, the darkness vanishes. It never really existed to begin with. John, You’re a Character. And a BIG CYBERHUG to you, and all that have replied to this column. Been doing a lot of reading, recently, and this column, and the replies so far, just bear out the singularity of The Supreme Creator. Ayn Rand said, “A Contradiction cannot exist”. And I figure it will cease to exist in a most gloriously explosive manner. We, as humanity, are soon to learn that the differences amongst peoples and nations are meant as tools for learning, and not as excuses for degradation and conflict. People are, TRULY, Beautiful, if only we would let them be. Well, Conshana, lots of folks have said I’m a character. But I know you mean it in a kind, positive way. 🙂 A big cyberhug to you too, dear brother. And, of course, to everyone who’s contributed their words and wisdom to this forum over many years now. I completely agree with you — differences are meant as tools for learning, and not as excuses for hatred and war. Of course, as A Course in Miracles says, all of that nonsense is an illusion — an illusion that will vanish when we remember we are all one with God. As you said, people are truly beautiful — every last one of us! Keep your light shining bright Conshana! I read somewhere that sin/evil is lack of love. Simple, really. It’s how to make the change if deeply entrenched in the lack of love that is the difficulty. Like any change, you need to want to make it. Thank you, Elizabeth. I like that definition of sin. It really says it all. As you say, it is simple. Greetings John/Spirit and everyone. May this person find inner peace. Now as far as satan/devil. Well they probably exist for some and not for others. I really don’t give much thought about satan/devil. So my answer is yes it exist, and no I don’t believe. See through all the years of learning from you and spirit. I’m pretty much comfortable of who I Am. So nothing that happens in our world shocks or disturbs me, for too long that is. Blessings! Thanks very much, Rene. Yes, indeed, may she find inner peace — her spiritual beliefs certainly are not giving her any. I agree with you on Satan — if we all create our own realities, then Satan certainly is real for those who believe in him. I really appreciate your kind words, Rene. The idea of Jesus and Satan certainly are ‘real’. If you believe the entire world is an illusion then they are just as ‘real’ as the rest of the illusion. My path has been a winding one, but through voices like yours John, and others, I eventually found myself working through A Course In Miracles. Part of me (that ego probably) regrets giving up the ‘magic’ of ‘creating’ a parking place or wealth or whatever. Accepting we created it all is humbling. I so wanted to believe that despite the horrors of this world it was still real. So I can see where this person is coming from. Letting go of these ideas can be terrifying. I agree — accepting we create it all is humbling. I can empathize with the lady — I came from a similar religious background, albeit not as severe. As you say, letting go can be scary. Can you imagine what our world would be like if from birth we were encouraged to be our true selves and if school was a place where you went to laugh and dance and sing and make whatever you want in art and be outside enthralled by the songs of the birds, encouraged to talk to, climb and hug the trees, touch the Earth, watch things grow, discover all on your own what you want to BE and DO and learn about based on how you feel and what you love? And out of your natural inclinations based on your own desire you would easily ask to be taught about any subject under the sun that you might be drawn to? And imagine that if you did go to any kind of ” church ” it would be a wonderful uplifting place where enlightened, happy awake human teachers began to teach you as a small child about your creation powers, how to use your imagination to create whatever you think about and give your attention to…how the Laws of Allowing and Attraction work and that you are God in a human body – inviting you to be in your joy at all times and to trust your feelings and follow your bliss and that it’s good to love and trust your beautiful perfect self because you are Love? And to teach you that life is a miracle and how to heal and manifest anything? And how music and singing connects us to SOURCE? That is a world I would love to live in! Thank you, Martha — that would indeed be a wonderful world! I believe we’re getting closer to that. And most importantly, that LOVE IS ALL THERE IS would be the only thing a child ever knows because she/he would be taught to SEE ONLY LOVE FOR THAT IS WHO YOU ARE? And by taught I mean demonstrated by adult humans who also SEE ONLY LOVE? Can you imagine the possibilities here and what bliss, creative genius and ecstatic co-creation and happiness could be in our world? This is my VISION FOR EARTH. I pray this person overcomes their fear. Satanism is a human practice and not of God. Thank you, Martha. I agree. What this lady is believing is so similar to what I was taught that I could identify with what she was saying, even though that’s not my belief. The lady sounds like she is quite mentally unsettled as she talks of demonic forces taking over her inner thoughts. It’s such a shame that fear based belief systems can cause such pain and suffering. Although I no longer have similar beliefs to the lady, I do respect that each individual has the right to believe whatever they like. It would be arrogant to dismiss and demean another on the grounds of an incompatible belief system. In the lady’s mind she was trying to help you, even though it can be incredibly annoying to be told what to believe. In uk some religions go ‘door knocking’ which can be a good exercise in diplomacy and self control Hehe!! But it’s all about faith in the end. We create our own existence so who really can say what is the right path and what is the wrong path? We are all heading in the same direction, so does it really matter? And I say that in faith from my own belief. Respect everyone, live and let live. Yes, this lady has a good heart, but certainly does not believe others can have a “truth” different from her own. As my spirit guides say, there is no absolute right or wrong — only what’s right or wrong for us. When I was growing up in the Jehovah’s Witness faith I was also having a lot of psychic experiences. It watery confusing as I was taught that these experiences were the work of Satan and evil spirits. I was also taught that I would die at ‘Armageddon’. This was terrifying, especially being so young. Although I believe that everyone has a right to their own beliefs, I feel that children should be left to make up their own minds when they are old enough. I see no harm in teaching comparative religion objectively as long as it is not indoctrinating. I think children should have the option to make their own choices. My grandmother was very much like the lady in the letter. I used to take what she said with a pinch of salt when i got older. It wasn’t easy but I got used to it. All we can do is love them anyway and let it go over our heads. My experience in growing up is similar to yours. We were raised in a loving family, but they were traditional Roman Catholics. My psychic experiences scared me, and there was literally no one I could talk to about them. I agree with you on letting children make up their own minds. After all, they remember much better than adults what it’s like in the realms of Spirit. For those who may not know that beliefs create reality, I’d give them a try-it experience. You complain about traffic, them you will get more traffic. The universe does understand the word “no”. Play a game with yourself and focus on what you do want – with appreciation, and watch how it shows up. Focus on unwanted and see how fast it manifests. I’ve done this for years and enjoy the precision at the delivery., I recently received 2 bags of spicy New Mexco roasted chiles. Returning for the trip, a gal at the office gave me verde mole sauce concentrate – the perfect addition to make a flavorful sauce. I couldn’t have planned this on my own. It happens over and over. Trust and choice to trust is the key. The universe is a great resource. Use it. You are loved and deserve to have great things happen. We are all equal in our focus to accomplish. Thanks again, Terri. I love your experiences with all this. We are indeed powerful creators. And in this era of quickening energy and increasingly higher consciousness, we’re becoming even more powerful. It’s an exciting time to be alive! I appreciate your reminder about the power of focus and intent. I still, despite my better knowing, have a habit of talking about the problem. I’m a really good talker and storyteller! It’s so easy for me to get I to the stream of telling the story of wha is happening now or even what happened yesterday.. My family is quite theatrical..some of us are performers and actors etc so this talent is a hard on to reroute! I need to find a way to discipline myself to ONLY TELL THE STORY OF WHAT I WANT – and stop giving attention to telling the story of what I don’t want – because if I’m telling that old story today I’ll be having it for lunch tomorrow. I need to learn to let the details hang. Telling the story only of what I want even though it seems impossible or very far away from my current reality feels like playing pretend in a way. Something that children do with ease but most adults ( even this one ) find pretty challenging. i’d love to hear anything you or anyone else does to stay in a positive stream if you feel like taking a break from talking about Satan. .! I’ll let Terri answer for herself. But I can tell you what works best for me — meditation. I meditate twice daily. That, more than anything else, helps me “stay in a positive stream,” as you put it. I still can get off track now and then. But I know now how to quickly get back on track. Another great topic for discussion. The question I see posed is “Do you believe your beliefs create reality?” Cuz if you don’t know the answer, one may assume randomness or goodwill or even ill will experiences will permeate your existence. Once a person understands that “choice” or “choice of beliefs” is what makes things manifest, the responsibility shifts to the person – and no longer a responsibility of god-like or demon-like experiences. I’ve played around in the realm of beliefs, and the results are extraordinary. A challenge to the non-believers is to pick one small thing that you’d like in your life, focus on it with appreciation and watch what shows up unexpectedly. You want more road traffic, then complain about it daily and you’ll have a bunch more. You want something to go with the spicy green chiles recently given to you, watch what comes into your preview (I just got a jar of conc green verde). Need a new shirt or have one to give, it will become clear through the impulses you receive. Every being is so loved in this universe, and if they feel unloved and unworthy, the equivalent interactions will be returned. Feel good about things and good things will comes your way. That’s my 2 cents worth and priceless from my experience. Any doubters just place a short term experiment. You’ll love what shows up. Hugs. Thanks very much. I completely agree with you — what we focus on is what expands in our lives. As you said, any doubters can easily and simply check it out for themselves. Well I think Abraham summed it up pretty darn well –I do get a kick out of ‘ghost hunters’ and such shows as I basically sit there and watch them scare themselves to death–! I love all these replies. It was certainly something to wake up to first thing in my morning before I’d had my first cup of tea. As I said at the time though, I was interested in my own response – after I’d had my tea and my eyes were properly open. Something like this may have wound me up or upset me in the past, now I just find it ludicrous and certainly not worth getting worked up about. Thanks very much, Barbara. I agree — these things are not worth getting upset over. My spirit guides are always saying one way to find peace in our lives is to simply accept everyone as they are. Remember the saying, religion( MADE BY MAN TO CONTROL MAN)how sad . Since whatever anyone thinks has been manifested on one level or another there cannot be a truth or a lie. Further these ” thoughts” when coated with intensive emotional energy not only exist but are addictions which are contagious. It is up to us as individuals to decide what life we want to create for ourselves. Though it might be nice to create love and happiness for others, they too have to choose. Contrast will never disappear and that is necessary in this unioverse. Now I have vented and my attention goes to the family dog. An over-zealous Christian friend once expressed deep sadness that she ‘would not see me’ after I told her my spiritual stance on her request. “Do you mean that you are going to heaven and I’m not?” I asked her. She replied in the affirmative. As I went to get lunch ready, spluttering inside but not wishing to lose control, I asked if she would like her soup hot or cold. It got me through the situation – I don’t know if she picked up the nuance! And all I read reinforces those three truths. What a gracious gift that was – and still is. I have discovered the simplicity of a life based on acceptance of others as they are and – unconditional love. Love and light to the poor person who is in the grip of delusional thinking. May he/she find inner peace and healing. Love to you, John, and thanks for being sharing everything you do. Like you, I too have discovered how simple (and peaceful) life can be when we accept others as they are. Believing is not the same as Knowing is it? No, it certainly is not. So many people are afraid of themselves, of their thoughts, even of their actions. Is it right, is it wrong, who am I to judge. All we can do is love them even if they can’t love themselves. I don’t believe we find things by accident, when the need is there we find what it is we need. This person found you (I want to say his, don’t know why)found your website because in their hearts they know they need your insight. We fear the devil within ourselves, project it out into the world or unto a person in order to deal with the idea. I think this person is doing this and congrats John your the image they have chose. I believe your light, your words, your heart will shine some perspective on this person. ON aside note: I lost my Melony (my beautiful pet cat) a week ago. I’m still dealing with her loss and see her in flashes as I move about the house. It brings a peace to know she is still here. I agree — there was a reason this person found our website. We may never know what the reason is, but I hope it helps her to become a bit more open-minded. I’m sorry to hear about Melony. I know how much she means to you. As we all know, our loved ones never leave us. I’m sure it brings you much comfort and peace to know she’s still there. Evil and Satan are figments of man’s imagination. The Bible was not emailed or faxed from “heaven” or outer space…..MAN wrote it according to his perception at any given time. Mostly for control. Thank you, Jan. I completely agree with you. i believe it better to be moderate and allow diff people to have diff views.. you can believe God is subtle and energetic or actual personal god .. all of it is true…if you believe there is a devil out to get you then well you gonna have fears.. there is no doubt we sometimes do things not in best interest of others and ourselves…we may not be perfect.. we always want to reflect on ourselves and correct our own mistake or fear or doubts to the right attitude… if we have a daily practice or some consistent way to always be love then everything will be perfect.. Thank you, Rafa. I agree — love is the answer to living the good life. When reading this I sensed a great, warm, loving smile from my spirit guides. They found it highly amusing. So did I, although neither them nor I feel that they are demonic at all. Also, I don’t think there is anyone who knows “The absolute truth”, not even the spirit guides, but we all have the freedom to choose which truth we want to believe in. As you say, we have the freedom to choose which truth we want to believe. And we have no right to say ours is the only truth.